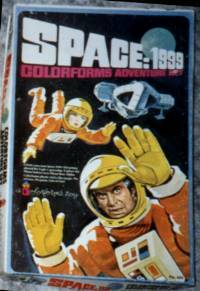 "Colorforms Adventure Set No 609". 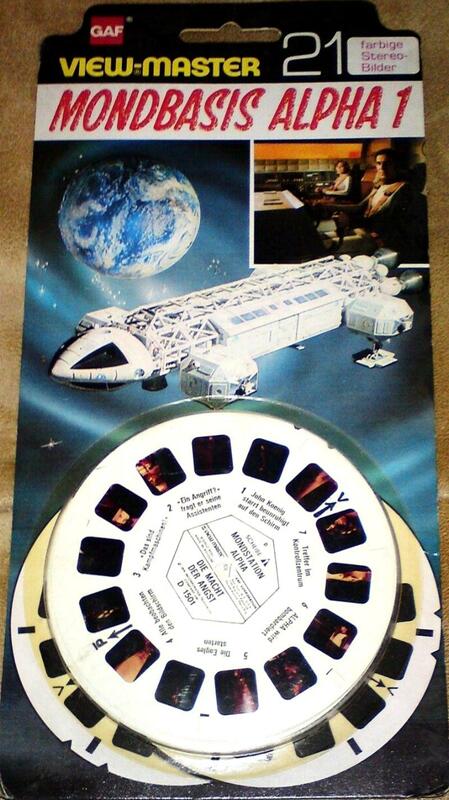 "Create your own Space 1999 Adventure aboard the Eagle 1 spaceship. Explore the Moon Surface near Moon Base Alpha. Colorforms plastic sticks like magic. No scissors. No paste. Lots of fun!" Harry and Patricia Kislevitz invented Colorforms in the US in 1951. 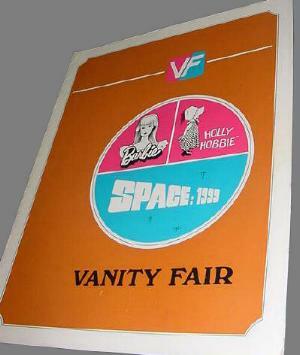 The concept was based on vinyl pieces which stick to the laminated backing art, but can be repositioned easily. The first Colorforms sets were abstract art, but by 1957 they had licensed Popeye. 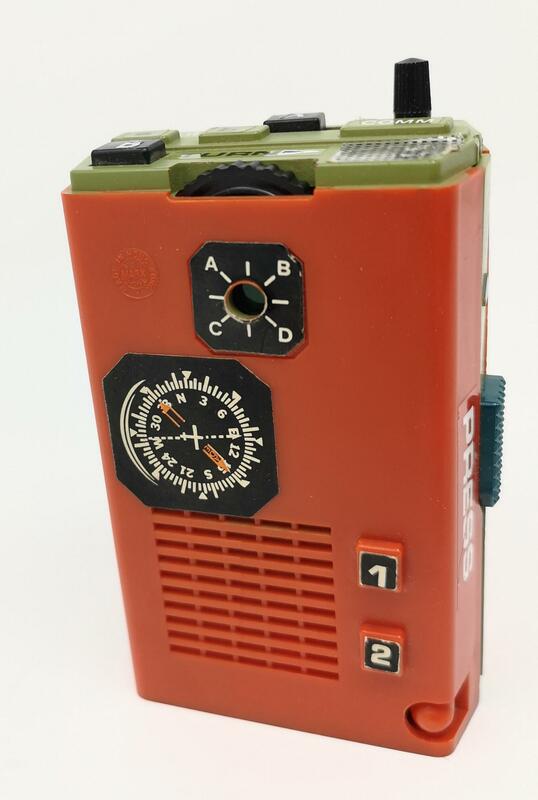 The company is still producing sets. Thick card backing (30.5 x 19.5 cm) with foldable 1.5 cm rim around: portrays crude art of cabin (in cut away) of Eagle on lunar surface. Two 23 x 8 cm boards hold self sticking vinyl stickers to be placed on backing. Stickers in black & another colour (white, yellow, red, blue), including 2 torsos (one uniformed, one suited) of Helena & Koenig, plus various individual arms, helmets, chest packs, stun guns and pairs of legs. Box 20.5 x 31.5 x 2.5 cm, art of Koenig & Helena floating in space by Eagle (front view, spine on underside); white series logo. 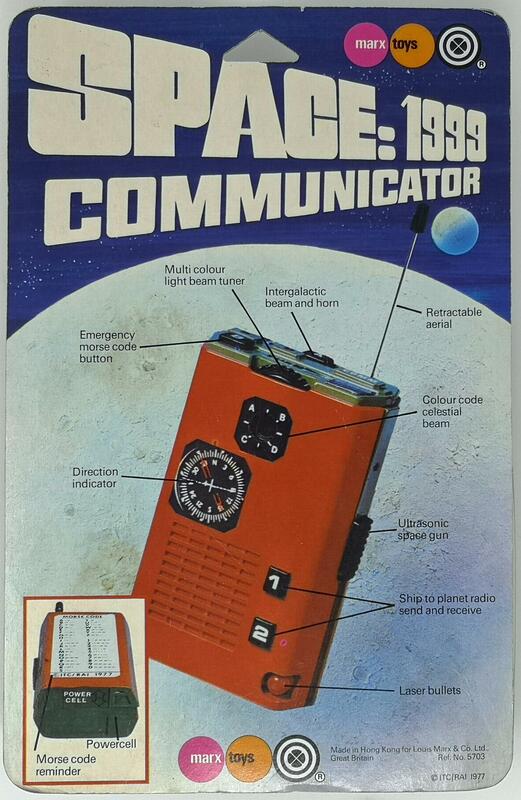 An 11 x 12 cm (folding out to 55 x 12 cm) colour leaflet shows the cover art plus three illustrations of the stickers in use on scenes from the board. "To the parent. 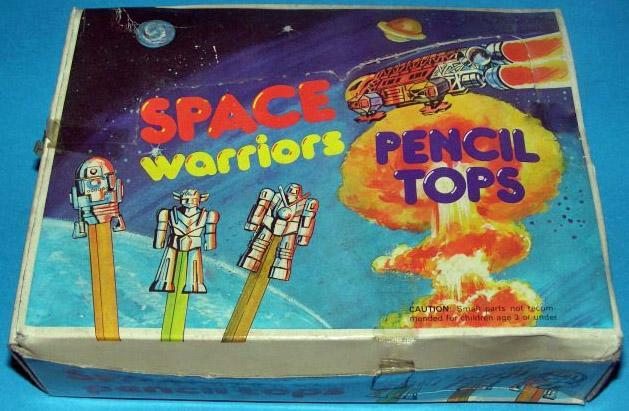 Colorforms' toys have a rare educational value. They help a child develop and improve these seven important skills: Finger dexterity, Sense of spatial relationship, Size matching, Building ability, Color sense, Sense of neatness and order, Use of imagination and storytelling ability." Original artwork in acrylics for the Colorforms game. 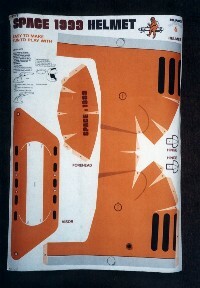 Cover art is 13" x 20" (33cm x 51cm), board art 13-1/2" x 19" (34cm x 48cm). The ViewMaster system for viewing 3D colour images was invented in 1939 by William Gruber for US company Sawyers, which specialized in souvenir photo postcards. 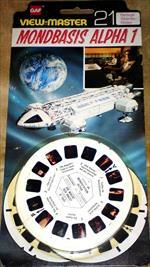 They used newly invented 16mm Kodachrome colour film, mounted as seven stereo pairs in a cardboard wheel. Their early sets focussed on scenic attractions. In 1966 Sawyers was acquired by GAF, a film processing company originally formed out of the American subsidiaries of German companies. 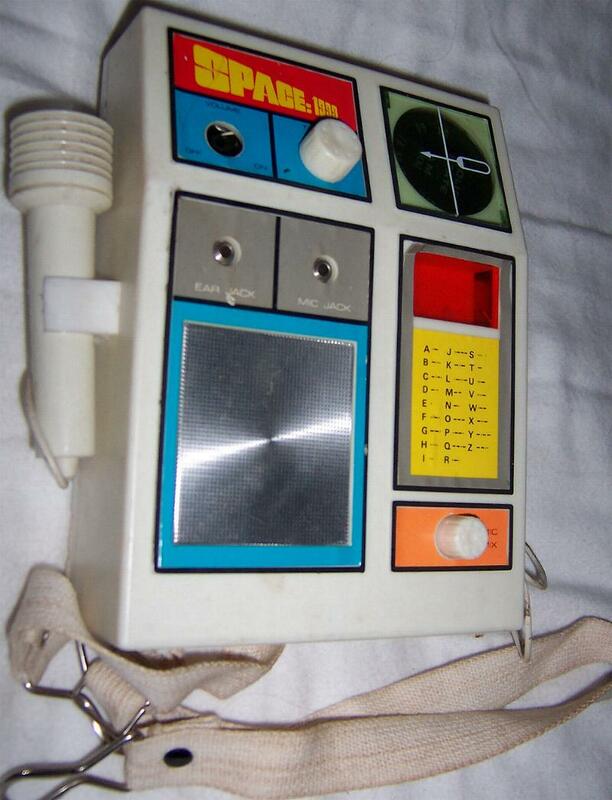 GAF positioned the ViewMaster as a children's toy, and signed up television licenses. 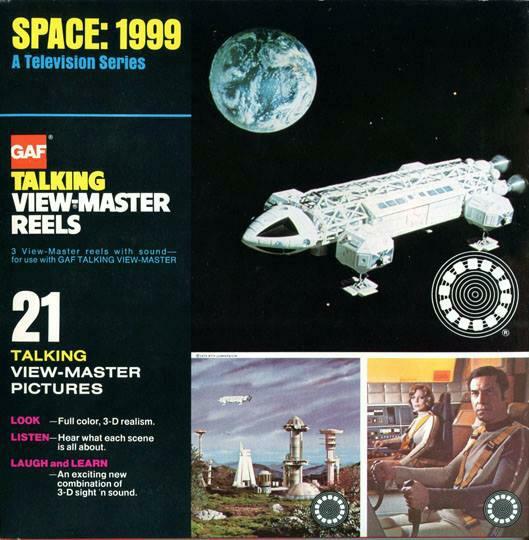 Sawyers had a Belgian plant from the 1960s, and by the 1970s the European and American divisions of GAF were producing specific reels and viewers for their markets, as well as sharing popular content. 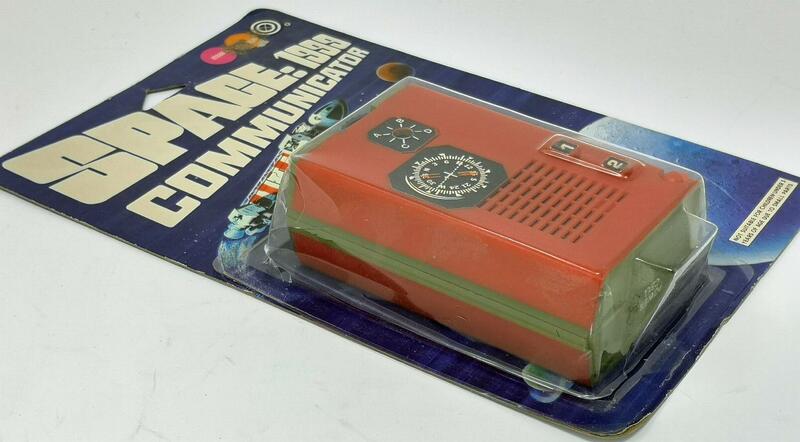 After a number of take-overs, ViewMaster is now part of Mattel's Fisher-Price brand. The individual reels are 9 cm diameter circles, each with seven stereo pairs of colour photographs, to be viewed in a Gaf Viewmaster viewer. There are very short descriptions on reels. 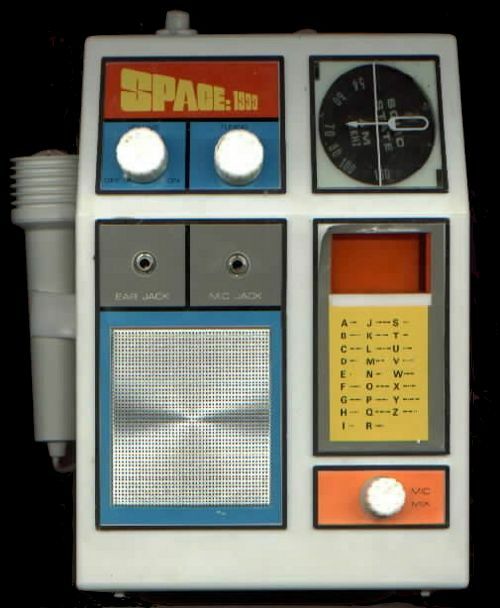 For the Space: 1999 set, the photos trace the story of "War Games", here titled "The Power Of Fear". The 3 reels are numbered D150 1, D150 2, & D150 3. There were four different packaging sets. 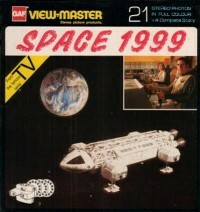 Later a blister card was issued in the UK. There was no booklet. 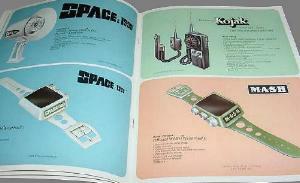 Versions for various European languages were also issued in this format (including German, Danish, French). 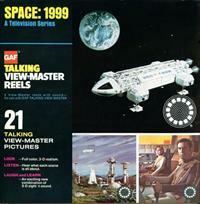 The "Talking Viewmaster" featured an audio disc providing a narration attached to each picture reel. 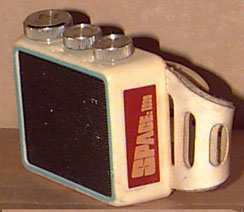 The box (20 x 21 cm) featured the photo of the Eagle by Earth, with two inset photos bottom right, of the planet surface towers and of Koenig & Helena in the Eagle cockpit. A small booklet (10 x 10cm, 16 pages) with black, white & blue line drawings on most pages was included to explain the story (titled "War Games"). 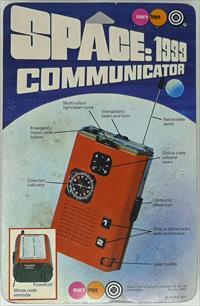 All covers showed photo of Eagle near Earth, with inset photo top right of Koenig & Helena at Eagle control. A yellow banner across top left proclaimed "From the famous TV serial". 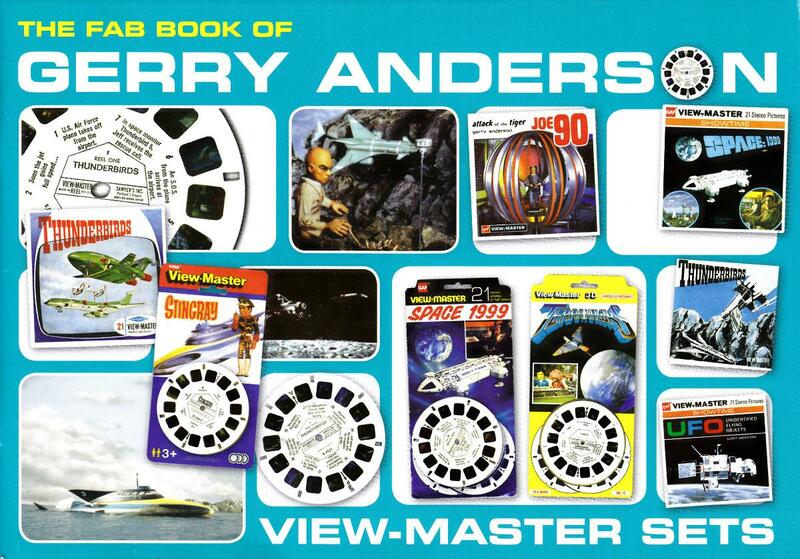 The Fanderson fan club published The FAB Book of Gerry Anderson View-Master Sets in Nov 2011. 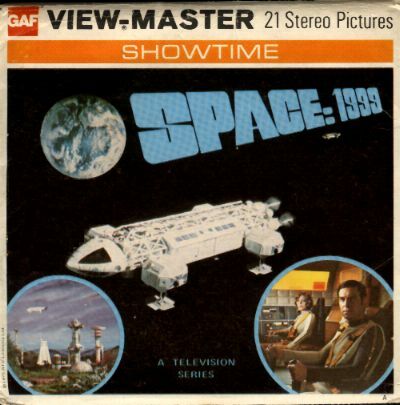 The Space 1999 View-master sets were covered on pages 36 -45. UK 1976. "Paperplay No 6"
A 42 x 89 cm sheet of thin card with an orange helmet to be cut out & folded. UK 99p 1977. Ref no 5703. Marx Toys was established by Louis Marx in New York, USA, in 1919. 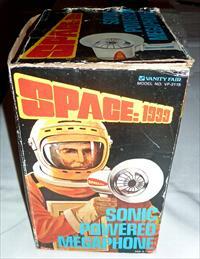 Marx went into sharp decline in the 1960s as Mattel grew dominant. In 1967, the UK brand was sold to a London company, Dunbee-Combex-Marx (DCM); in 1972 Marx US was sold to Quaker Oats, who eventually sold to DCM in 1976. DCM also bought Mattel's UK business in 1973, under the Burbank Toys brand (see Space: 1999 toys) and Hornby in 1972. 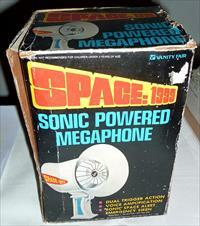 The company went bankrupt in 1980. 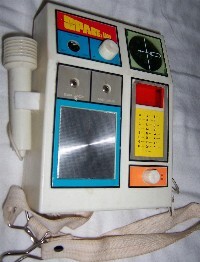 Another toy under the Marx brand was a bagatelle. 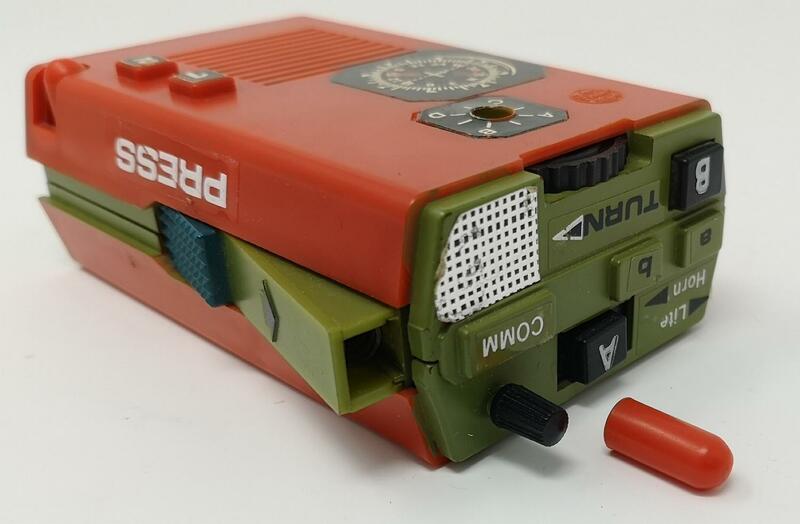 Red plastic box (6 x 10 x 3.5 cm). 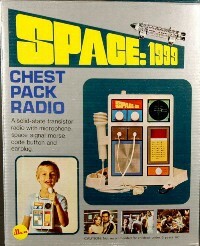 Features: "retractable aerial" (6 cm long retractable wire), "ultrasonic space gun" (a rather lethal spring gun set in side of box) firing "laser bullets" (red plastic pellets), an "intergalactic horn" (makes a rasping noise), and "colour code celestial beam" with "multi colour light beam tuner" (a small light with a dial moving colour filters over it). 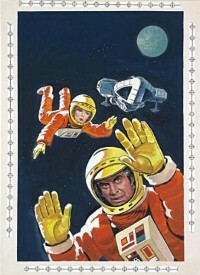 Blister pack: 15 x 23 cm card with logo and good art of Eagle & Moon. 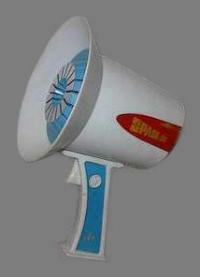 A megaphone. 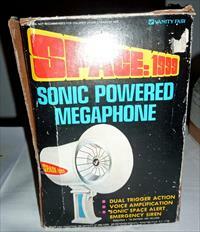 Requires 1 9-volt battery (not included). 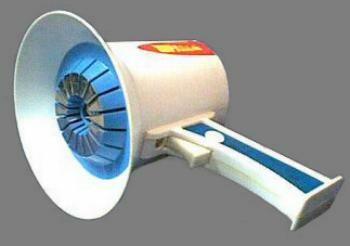 Two trigger action - voice amplifier/emergency siren. 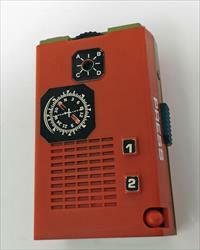 7.5 inches x 5 inches (19cm x 13cm). 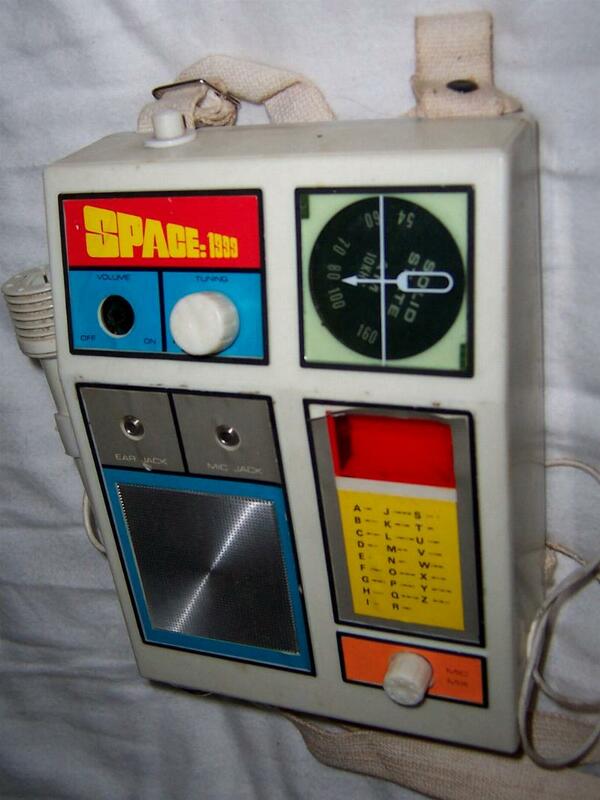 Box shows an astronaut using it (spot the scientific flaw!). 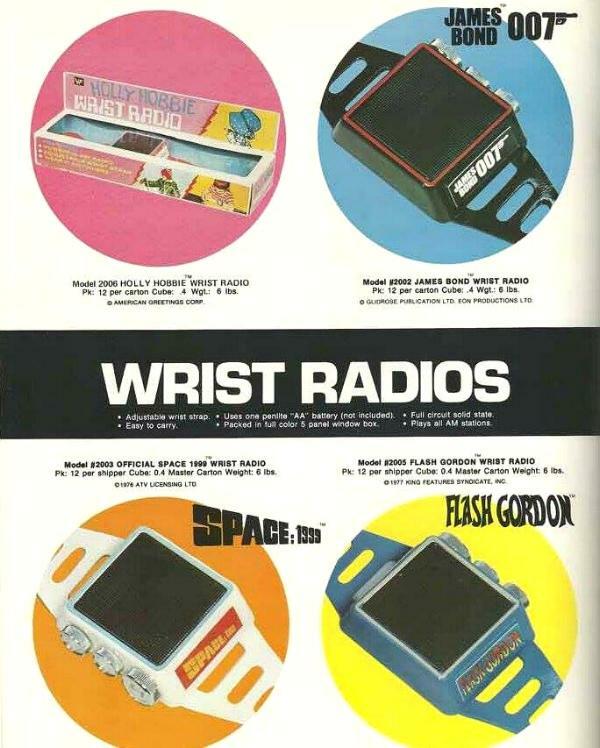 AM wrist radio. 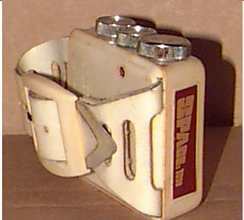 Large white leather strap, with a square white plastic radio and black speaker on the face. 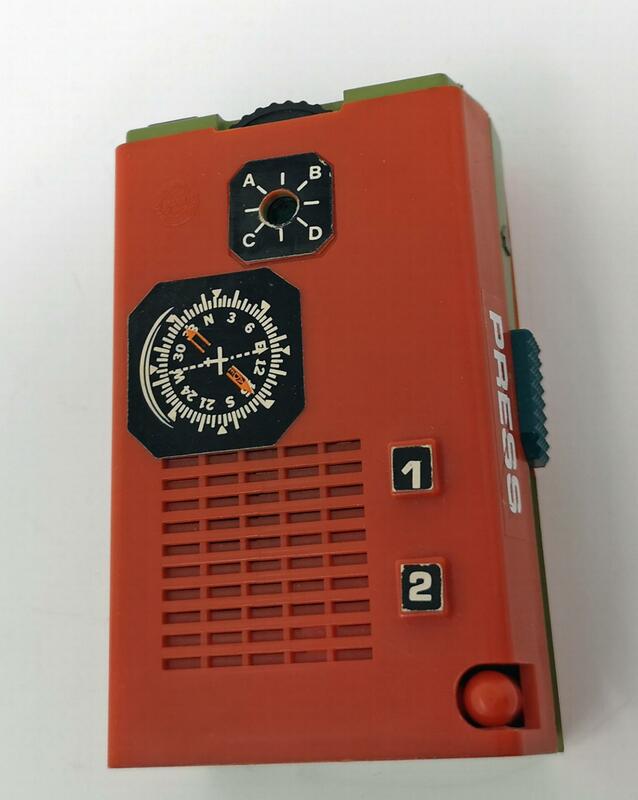 On one side are three silver metal dials (frequency, volume and on and off). 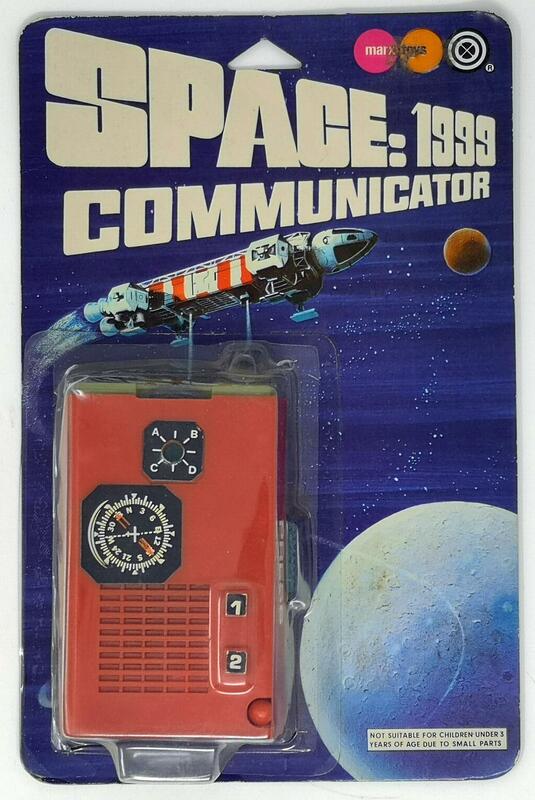 On opposite sides are "Space: 1999" stickers (yellow logo on red background). 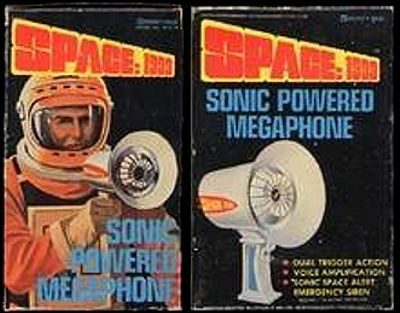 The box lists these "Features"
The 1976 Vanity Fair catalogue showing the Megaphone and Wrist Radio (note the MASH wrist radio is identical apart from the logo stickers!). 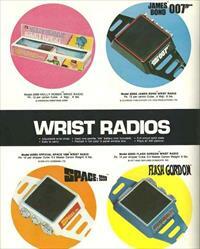 Another Vanity Fair catalogue shows the 007 and Flash Gordon wrist radios are also identical. These "pencil tops" are small rubber ornaments put on the ends of pencils. 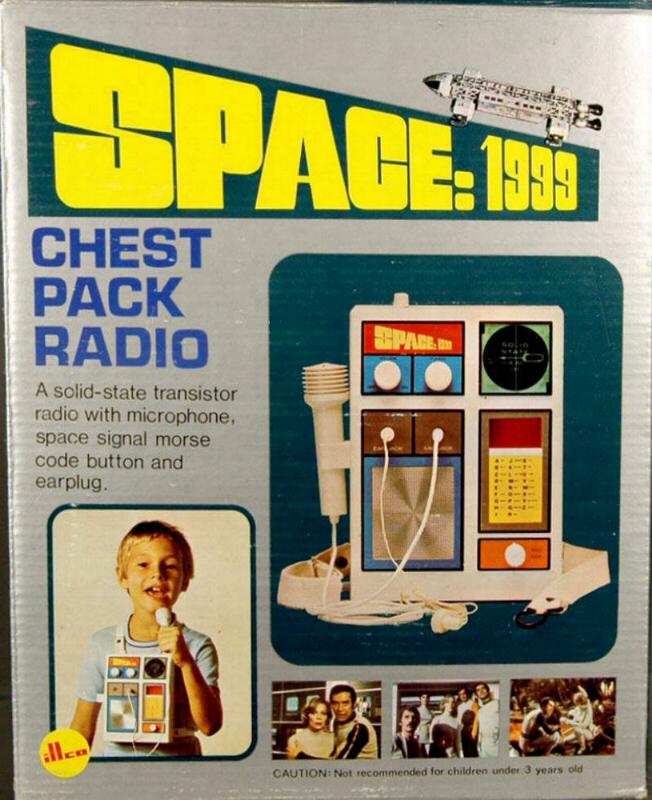 Judging by the R2D2 robot, they are 1977 or later. The box art is an adaptation of the second (1976) UK annual cover art, featuring a rescue Eagle flying over a nuclear mushroom cloud. 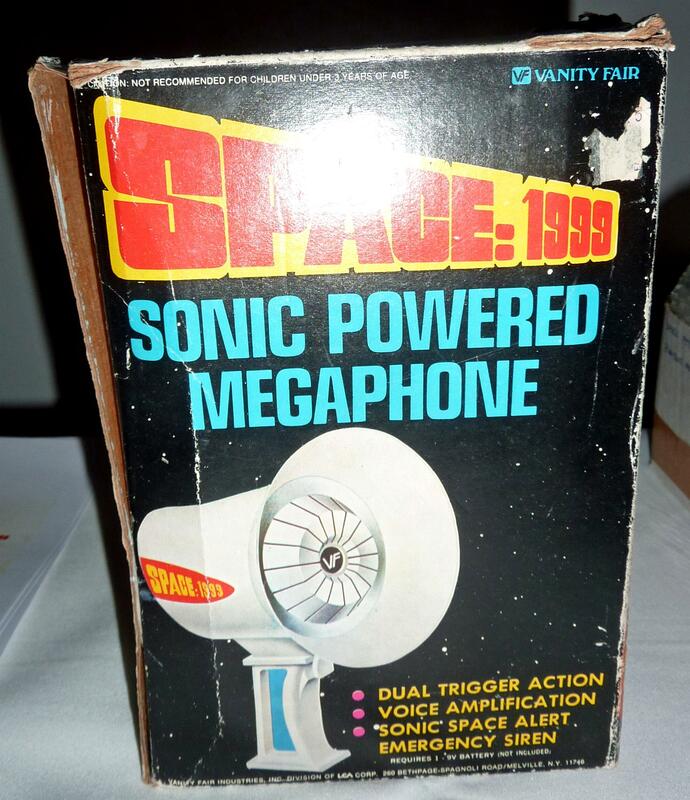 It was probably not licensed. Kenner was founded in the US in 1946, and had a number of popular toy lines, including the Give A Show projector (from 1959) and the Spirograph (1966). They were taken over by General Mills in 1967. 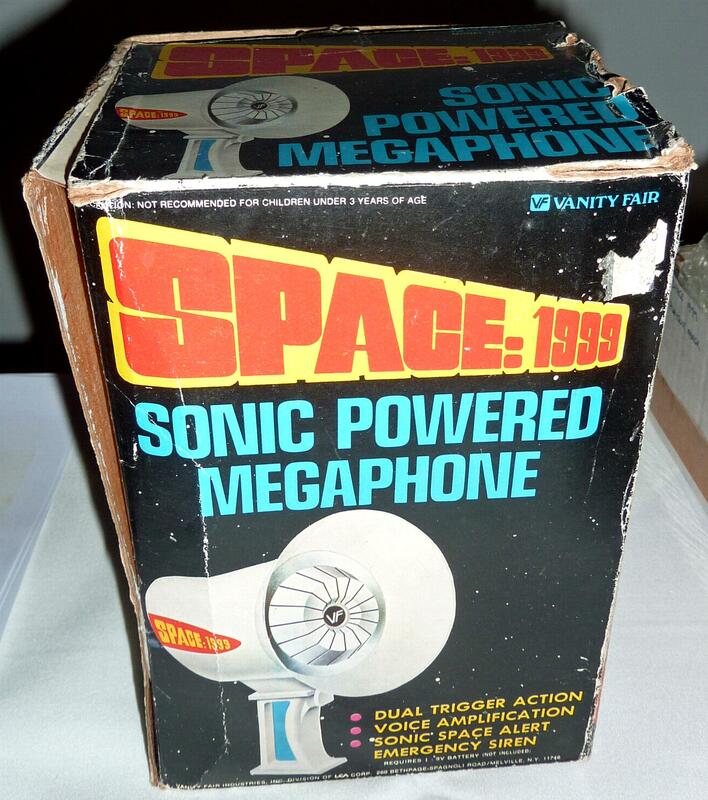 In the late 1970s they had a huge success with Star Wars figures. 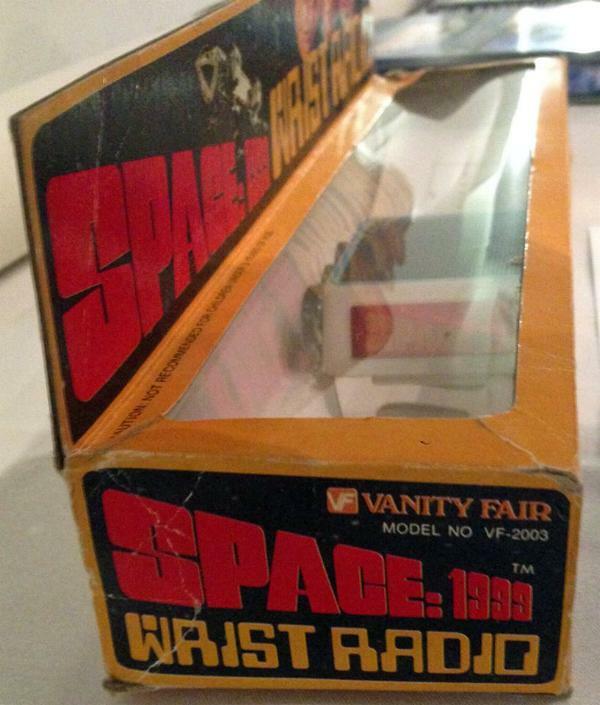 In 1991 the company was purchased by Hasbro, and the brand was closed in 2000. 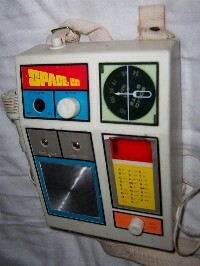 Give A Show was a simple projector, introduced in 1959 and continually reissued with different slides until the end of the 1970s. 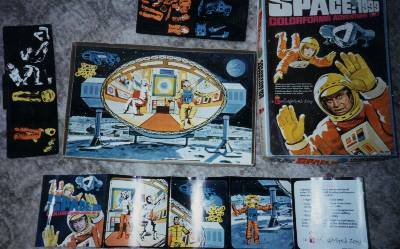 The slides were in stiff card strips of 7 different 35mm colour cartoon art. 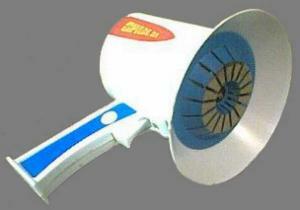 Projectors were generally sold with 16 card strips (so 112 slides), often a mix of different TV series. 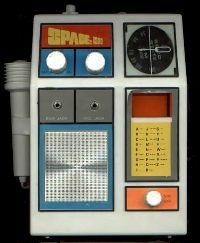 The subject series were almost always TV cartoons, although there were a few live action shows and even movies, like Star Trek, Six Million Dollar Man and Star Wars.Space: 1999 was one of the 16 slides in a 1975 set. In the UK Chad Valley issued the toy (with Dr Who and several Gerry Anderson series as subjects), but the set with Space: 1999 did not get issued (probably because many of the cartoons were not shown in the UK). 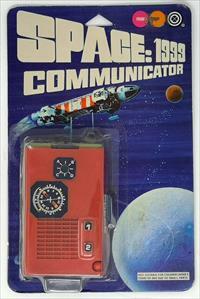 The Space: 1999 story is named "Operation Asteroid" and has the serial number 686-048-12. 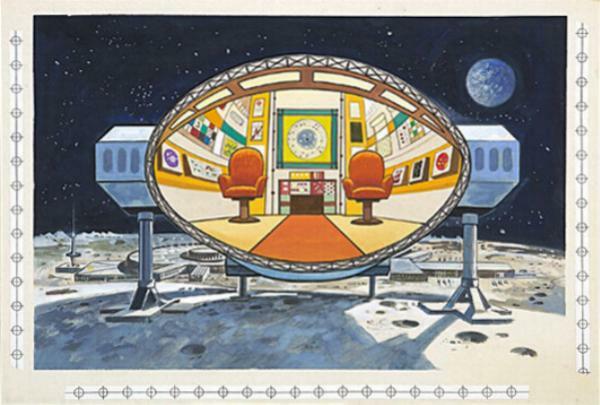 The sixth frame shows the Moon with a big chunk missing, probably due to the artist reading misleading ITC publicity. The asteroid is headed straight for us! The scanner shows a possible fault in the asteroid. Our only hope is laser surgery! The operation was a success, Doctor! 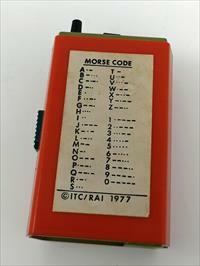 Contents copyright Martin Willey. 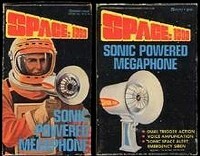 Thanks to Gordon Moriguchi and Allen Barnella.